It's 7:00 on the dot. Note: Don't confuse cuatro (four) with cuarto (quarter). Son las dos menos veinte. It's 1:40. / It's twenty to 2:00. Faltan diez para las dos. It's 1:50. / It's ten to 2:00. Son diez para las siete. It's 6:50. / It's ten to 7:00. Note: Use the imperfect tense when stating times in the past. It was 1:00 in the morning. En dos horas serán las once. In two hours it will be 11:00. Note: AM stands for Ante Meridiem ("before midday" in Latin). PM stands for Post Meridiem ("after midday" in Latin). It's 1:00 in the morning. / It's 1:00 AM. It's 3:00 in the afternoon. / It's 3:00 PM. It's 9:00 in the evening. / It's 9:00 PM. At what time does the plane leave? El avión sale a las dos y media. The plane leaves at 2:30. Roberto viene a la una. Roberto is coming at 1:00. Note: Spanish days and months are all masculine. Note: Setiembre (abbreviated "set") is also considered a valid spelling in some places. D, L, M, X, J, V, S.
Note: In some Spanish speaking countries, Monday (lunes) is considered the first day of the week. Notice that neither day names nor month names are capitalized in Spanish. To tell someone the date in Spanish, use this formula. Note: You may also see dates abbreviated this way: 5-ene-77. Notice that there is no need for a comma in Spanish. Note: When working with dates, Spanish numbers are masculine. Poor grammar is just one reason not to celebrate "Cinco de Cuatro" on May 4. This is only true for the first of the month. Don't turn May 5 into quinto de mayo; it's cinco de mayo. Hoy es domingo, el 21 de abril de 2019. Note: Anno Domini is Latin for "the Year of Our Lord." Voy a Guatemala en abril. I'm going to Guatemala in April. Me voy el tres de abril. I leave on April 3. Of the 21 Spanish-speaking countries in the world, only the U.S., Mexico, Spain, Chile, Paraguay, and Uruguay participate in Daylight Savings Time. Salvador Dalí's view of time. To a North American it may seem that Hispanics have a very relaxed view of times and deadlines. While airline, train, and TV schedules tend to be punctual, informal gatherings may not actually begin until an hour or more after the agreed upon time. A meeting scheduled for 6:00 may not get started until 7:30. 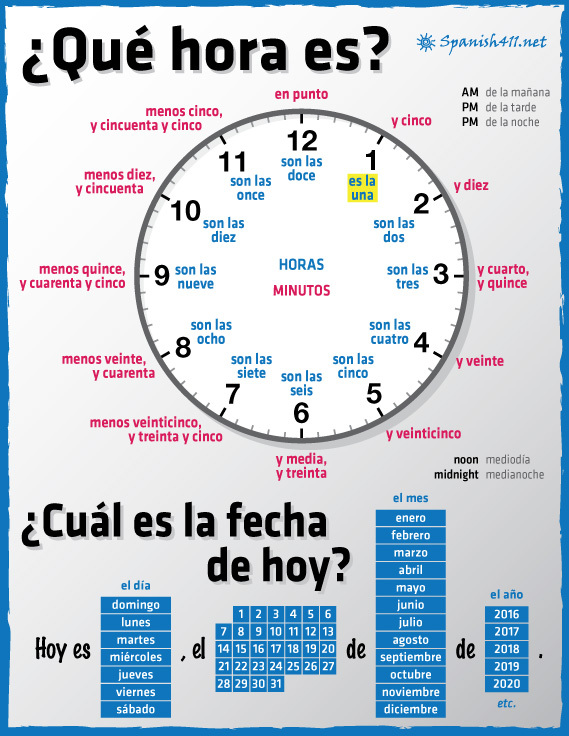 If a Spanish speaker asks to meet with you a las siete, it may be more accurate to think that you've been asked to come no earlier than 7:00. Sometimes the word mañana may be better translated as "not today." At 8:00. / At 1:00. Son las tres y quince. / Son las tres y cuarto. Son las cuatro y treinta. / Son las cuatro y media. Son las cinco y cuarenta. / Son las seis menos veinte. A las ocho. / A la una.